iolo System Mechanic improves the performance of your computer by getting rid of junk and optimizing hidden windows settings. It repairs and fixes windows errors and provides a stable computing environment. The tool boosts speed by tweaking CPU, RAM, and Hard Drive settings. It fixes frustrating errors, crashes and frequent freezes. iolo System Mechanic increases the performance of computer and improves its stability by fixing more than 30,000 different errors. It removes more than 50 types of junk files from your computer and boosts its speed. Also, the tool helps you to remove bloatware causing slow startup. It automatically optimizes the settings of Windows PC to speed up the download, page loads, videos, and gaming experience on the internet. 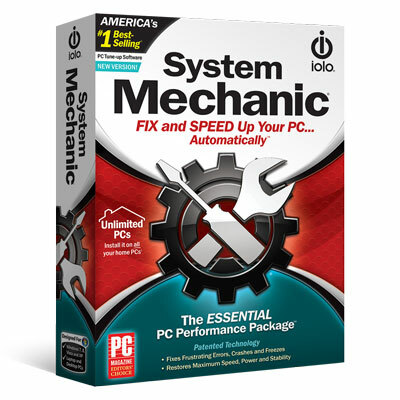 Let’s take a look at the features of iolo System Mechanic. The dashboard of iolo System Mechanic displays the status of your system. It shows the issues found on your computer and represents the state with a meter. System Mechanic also lists recommendations on the home screen. You can respond to the recommendations to improve the performance of your computer. The Toolbox tab lists all the tools based on the category by Clean, Speed Up, Protect, Recover, and Mange. The All-in-one tools list all the tools available, and you can search and use according to your need. The ActiveCare tab of System Mechanic lets you manage the settings of Automatic PC Maintenance. You can enable/disable each component from here. The Real-Time Status tab shows status of your CPU, Memory, and Hard Drive on the real-time basis. You can also configure it by clicking on Configure. The Internet Security tab has two components, one is Anti-Malware, and another is a Firewall. You can customize the settings of these components from here and also can enable/disable them. The Reports tab of iolo System Mechanic lists two components. The IntelliStatus gives your Comprehensive PC Status, and history tab lists recent actions System Mechanic perform. You can also rollback any changes if you face in irregularity in the performance of your PC with the help of SafetyNet. Click on the Open button to use the tool. System Mechanic hard drive defragmenter aligns your hard drive and removes cluttered area. It frees the space in a way that can be used by other programs quickly. It also shows the status of your hard drive in a pie chart. iolo System Mechanic is a complete solution for your Windows computer if you want a stable and error-free computing experience.